I treated myself to a new camera this week and today is the first time that I was able to experiment with it. The photo above was taken in black and white and since I’m learning to use photoshop, I was able to add this fading out border. I’m really excited about this picture. 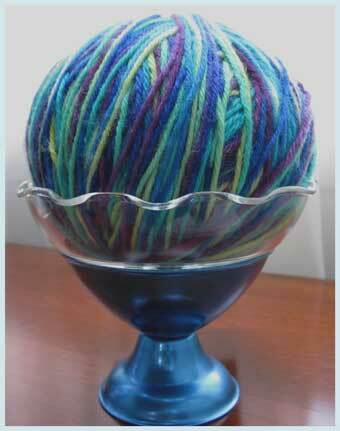 The yarn can be any color your imagination chooses. 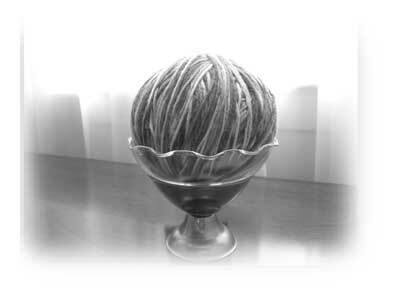 As for the yarn itself. Here it is. This is 280 yards of Little Lola by Schaefer Yarns in my latest find. I purchased 4 of these dessert dishes at a flea market for $1 each. There’s a blue one, a gold one, a green one, and a red one. When I saw them, I knew they’d be great for photographing yarn. Wouldn’t this make the nicest note card? As for the yarn, this was in a huge plastic bag in the garage with yarns that I thought I was giving away. But…. I brought the bag back into my studio this afternoon and I really like most of it, so back in the stash it goes. This yarn is definitely going to be a pair of socks. I really like the colorway and can’t imagine why I was going to give it away. Which brings me to….it’s time to finish at least a few of the many socks that are already started. My UFO pile is endless!